When property prices reach such outlandish heights as in Hong Kong, it creates some peculiar distortions in the local market. Whenever I walk around Kowloon Tong, a wealthy, low-rise neighbourhood not far from my apartment, I’m surprised by the number of derelict and seemingly abandoned houses. Kowloon Tong was first developed as a garden suburb in the 1920s, with identical tile-roofed houses that strike me as vaguely Southeast Asian in appearance. By the 1950s, many of those houses were being demolished for larger, more modern villas and small apartment buildings, which in turn were redeveloped into luxury townhouses or even larger apartment buildings in the 1980s and later. Despite the successive waves of redevelopment, there are always reminders of what was left behind. One such reminder can be found on Derby Road, an unassuming little street behind the Maryknoll Convent School. That’s where I came across a large abandoned house, early modern in appearance, with a staggered form that makes it look like it was sliced off the top of an Art Deco skyscraper. The house has two wings, one slightly larger than the other, and a walled, overgrown garden with two gates, one facing Derby Road and another facing Chester Road. 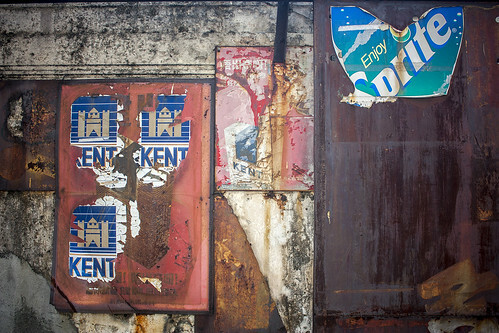 On the Derby Road wall are old advertisements for Sprite and Kent cigarettes, with the faded name of a see doh — variety shop — written on the gate. It seems that, at some point in time, there was a small shop or hawker stall on the property. But those are just theories. So I decided to investigate. 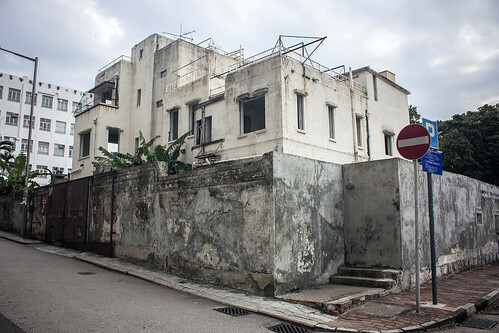 Centaline, which maintains an informal directory of Hong Kong properties, says the structure on Derby Road was completed in January 1945 and contained three apartments. That doesn’t make much sense; Hong Kong was still occupied by the Japanese at that time, and it seems unlikely that anyone was building new apartment houses in a depopulated territory ruled by martial law. A search of the Hong Kong government’s land registry shed a bit more light on the situation. According to the official property record, 4 Derby Road was first subdivided in 1898, when the British leased the New Territories from China for 99 years. (Kowloon Tong sits north of Boundary Street, so it wasn’t technically part of Kowloon, which was ceded permanently to the British in 1860.) It sat empty until 1949, when it was purchased for HK$30,000 by the Chiu family, also known as Trieu, which suggests they were Chinese from Vietnam. That is presumably when the house was built. What happened after that is a bit murky. 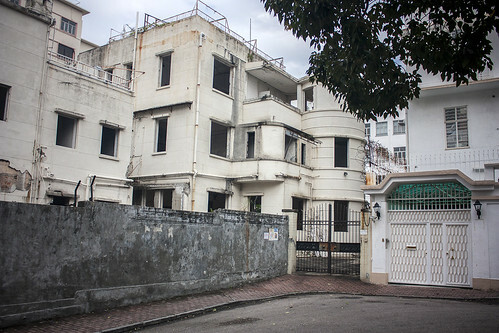 The property record states there was a legal dispute in 1984 between Chiu Sin (aliases: Trieu Thien, Chiu Sin Mau) and Lee Ng (aliases: Suen Kit Ching, Ly Ngu, Ton Kiet Tinh) which dragged on for nearly 20 years until the property was finally sold for HK$45 million in April 2003 — the height of the SARS epidemic — to a company called New Loyal (China) Limited — a private company that was registered just six months before it bought the Derby Road property. And that’s the end of the story. A protracted family dispute led to the property being sold at a high price to an investment company during the worst real estate crash in recent history. Just another page in the history of Hong Kong property: family drama, a mysterious investment company and a once stately building now standing ruined in the most high-priced district in Kowloon. 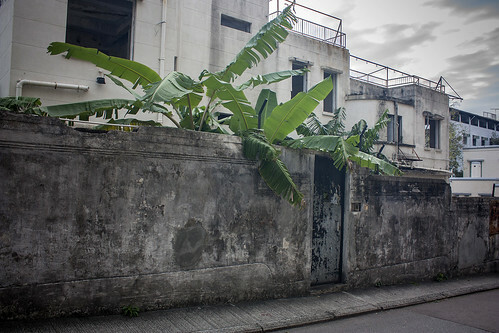 This entry was written by Christopher DeWolf , posted on Tuesday April 23 2013at 02:04 am , filed under Architecture, Asia Pacific, Heritage and Preservation, History and tagged Abandonment, Exploring the City, Hong Kong, Housing, Kowloon, Kowloon Tong . Bookmark the permalink . Post a comment below or leave a trackback: Trackback URL. 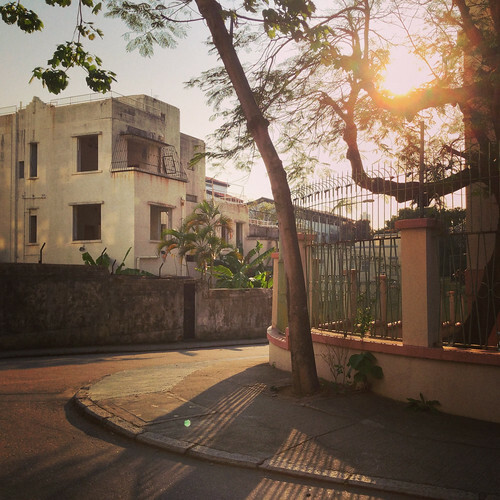 I live on the edge of To Kwa Wan/Kowloon City and often wander around Kowloon Tong in the weekends. I’ve always wondered about this — now I know. Thank you.